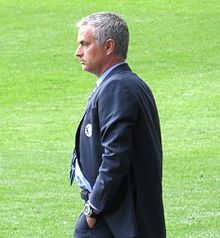 Once again, Jose Mourinho (pictured) will lift the Premier League trophy after his Chelsea side wrapped up the title with three games to spare. The ‘Special One’ has the special touch when it comes to winning league titles. He did it in his breakout year as a manager with FC Porto in 2003. He won the Primeira Liga again with Porto, as well as the UEFA Champions League, the next year. He moved to Chelsea at the start of the 04/05 season and his reign bore immediate glory as he won the Premier League, a feat he repeated the following year. Four league titles in four years isn’t too shabby a record. In between that tenure at Chelsea and his current one, there was the small matter of winning league titles in his two years at Inter Milan and another at Real Madrid in 2012. He’s one of four coaches to have won league titles in four different countries. This season’s triumph didn’t break that record but there was an air of invincibility about it. Chelsea led from day one. Chelsea now has five Premier League crowns to its name. Mourinho has been there for three of them. His secret? He loves to win. Sure, that sounds obvious. But he is known for it. Where teams like Barcelona, Arsenal and Bayern Munich play attractive, possession-based football, Mourinho is known for doing whatever it takes to win. Go up 1-0 and he’ll shut up shop, bringing on an extra defender and ‘parking the bus’, defending deep. It doesn’t always serve him well. In last season’s Champions League semi-final against Atletico Madrid, Chelsea scored early, sat back and looked to defend the lead. Atletico overran them with three goals through sheer weight of attacking chances. Sometimes the best form of defence is attack but his style of play has brought him almost unprecedented success. He had by far the superior team in the Premier League this season, having brought in the Spanish duo of Diego Costa and Cesc Fabregas to add to an extremely strong squad. Costa scored seven goals in his opening four matches and scared the chasing teams. Fabregas leads the league in assists. So he’s done it again. The last day of the season, 24 May, will be a very special one for Jose as he once again hoists the Premier League trophy high.